I was contacted by a client who liked my artwork on Behance and wanted to commission me to create a custom toy design to celebrate his daughter Josie’s 4th birthday. 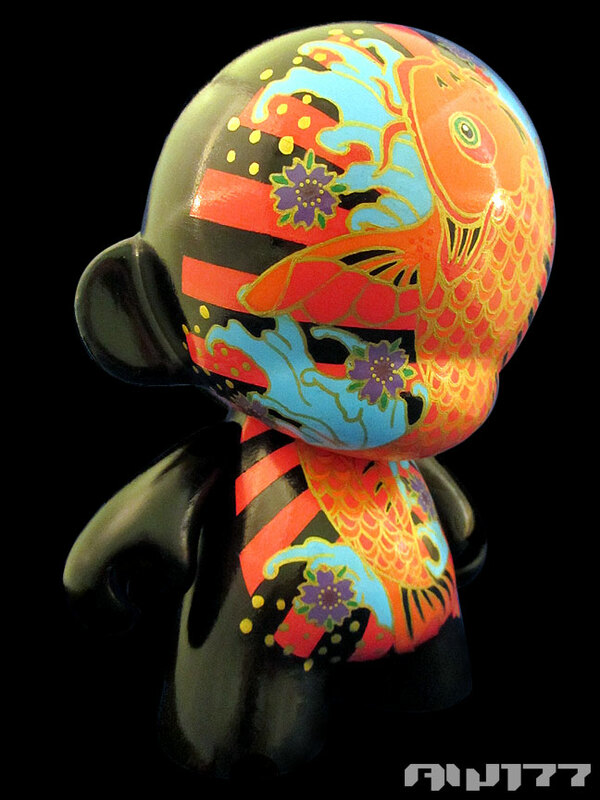 We chose to work off a 7″ Kidrobot munny, and basically just told me that his daughter likes fish, horses, her favorite colors are oranges reds, blues and pinks. 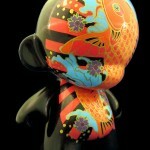 The deadline was really short for me (less than 3 weeks) – I usually take a month or so to complete a custom project. However, due to the nature of the project of making his daughter happy for her birthday and giving her something memorable, I decided to give it a shot. I have my own daughter who celebrates her birthday in December as well, and about to turn 3, so I can relate to what the client wanted done. 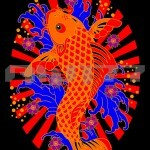 I decided to create another Koi fish design, something a bit different than my past designs. 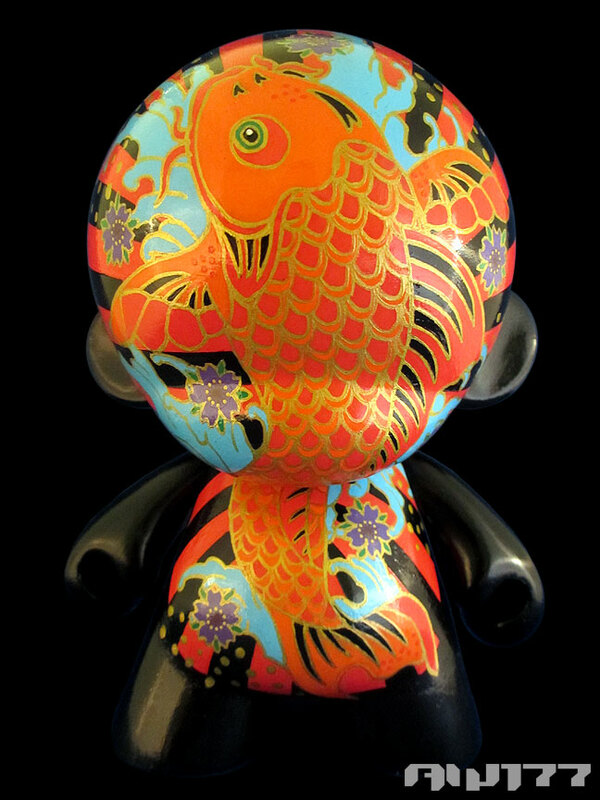 Koi are great because Josie likes fish and the koi represents energy, strength, and perseverance, all of which are great to gift unto her as she becomes another year older. 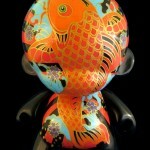 The koi fish has traditional colors of orange and red (some of her favorite colors) and sprinkles of black. 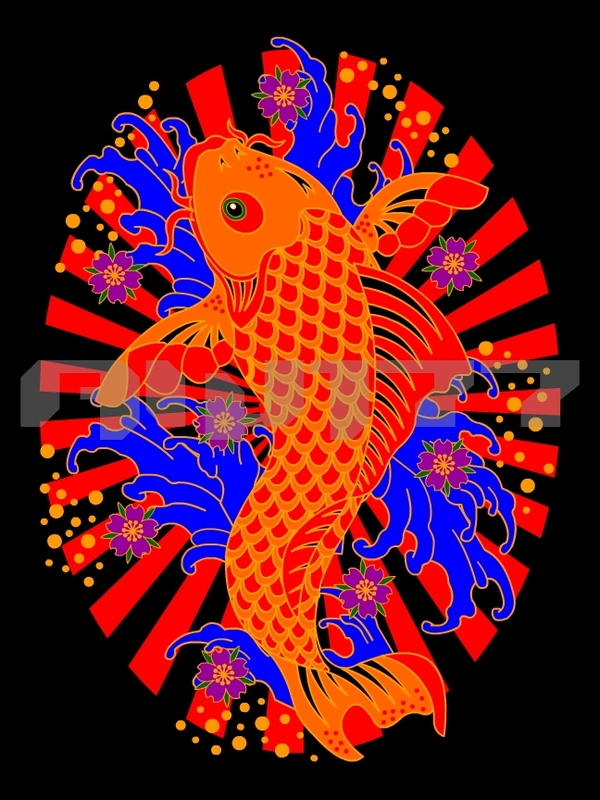 Blue waves (another color she likes) splashing around the koi and gold outlines and dots as gold represents prosperity, surrounds the entire piece. 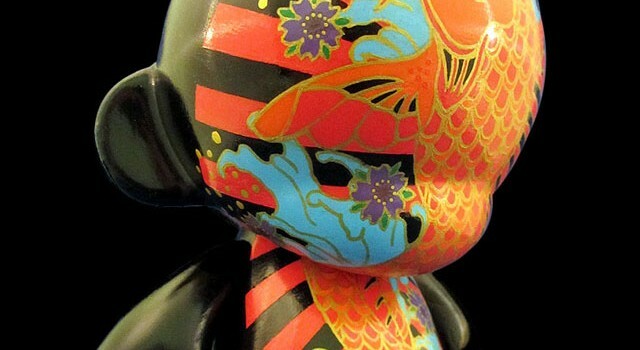 The cherry blossoms represent the beauty of life – there are 8 on the front of the munny because the number 8 represents good fortune in Chinese culture. 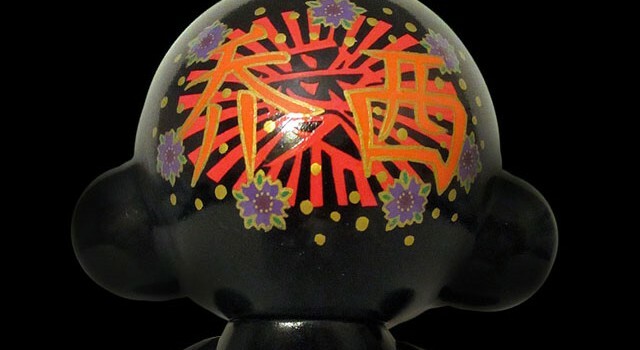 The back design has her name “Josie” written in Chinese characters, again surrounded in gold outlines. 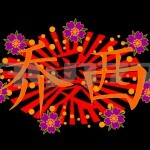 There are 7 cherry blossoms, as the number 7 in Chinese (and English) mean good luck. 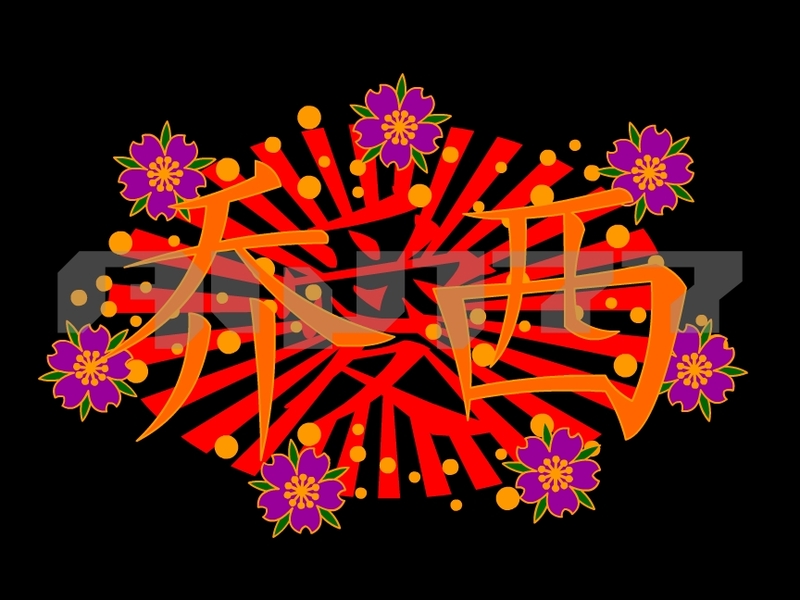 The red lines in the back has the Chinese character of “love” in it – it may be hard to see at first but if you look in the middle of the back design, you can see it. The red lines coming out of the character represent the love she is getting from her family and friends. 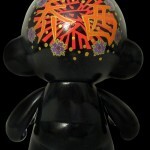 Finally, the black overall color of the munny body make all the designs pop out! 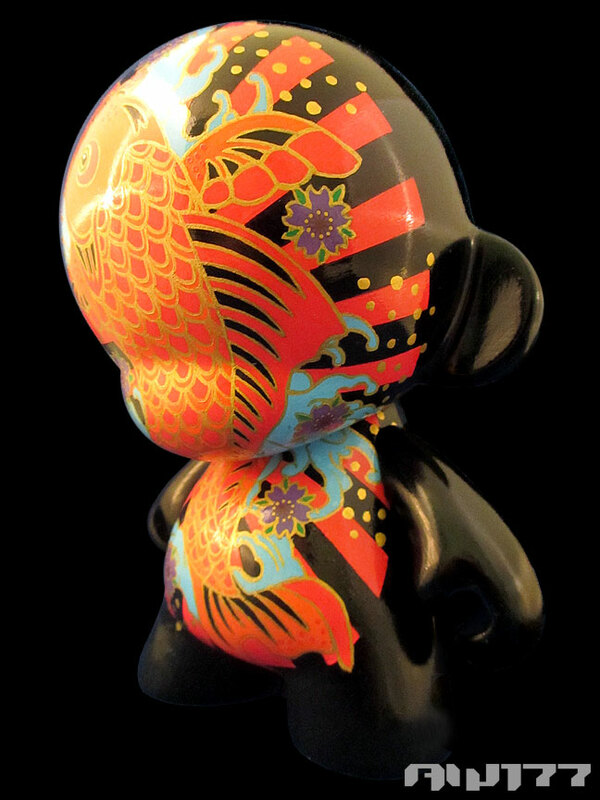 So this piece has a lot of meaning behind it and I hope she will take this munny with her and remember how much love was shown to her on her birthday. I enjoyed working on this project and the client loves it – “it’s phenomenal; I can see that you have really committed yourself to something special in this project…”. Thank you and Happy Birthday Josie!